Description: BNSF 1058 leads a very hot intermodal west at Lebo. 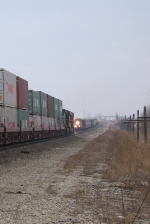 He is currently passing BNSF 4476 west and meeting BNSF 6746 east. Description: I wouldn't mind living at that house! Description: After waiting on two trains to enter the yard, this ex-Santa Fe SD40-2 hustles out of the yard to the north. Description: The RBBB Blue Unit being handed off from the UP to the BNSF near the Trinity River. Description: RBBB train crossing the Trinity River at Decatur St near Tower 60. Description: RBBB Blue Unit "on final approach" for North Yard at Deen Rd. Description: Yard Job 107 pulling into BNSF's North Yard. Description: The RBBB Blue Unit is a long train with five motors and 60 cars at 5319 feet (Not counting motors). Description: Yard Job 107 coming to stop at North Yard to drop off the conductor. The entire train still hasn't made it into the yard yet. Description: BNSF 6746 an SD40-2 was built as Santa Fe #5087 in October 1979 is at Saginaw, TX. 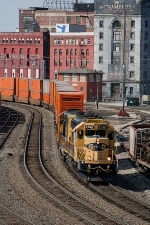 Description: BNSF 6746 SD40-2 Yellow Bonnet. Description: BNSF's YNYF1061-09 yard job.